NEW YORK -- Light Reading (www.lightreading.com) and KNect365 (https://knect365.com/) have joined forces to host the Big 5G Event (www.big5Gevent.com) in Denver, Colorado, on May 6-8, 2019, at the Colorado Convention Center. Big 5G Event is a combination of Light Reading’s annual flagship Big Communications Event and KNect365’s annual 5G North America event. This new 5-track conference covers the industry's most pressing topics by piecing together the 5G puzzle and digging into other key areas of networking innovation. With over 1,500 senior telecoms professionals across two days and world-class content delivered by Heavy Reading's team of leading analysts, the Big 5G event is the must-attend event for anyone who wants to stay up-to-date on the major challenges affecting the next-generation communications industry. The Big 5G Event also features a series of pre-event workshops on Monday, May 6, including a Women in Comms free-to-attend workshop which provides a forum to exchange ideas, learn and grow. The Leaders In 5G Executive Summit, an invite-only session which brings together key decision-makers to discuss the roadmap to 5G in North America, also returns to the event in 2019. Additionally, the highly acclaimed Leading Lights Awards is set for Monday, May 7. Leading Lights celebrate excellence and innovation within next-generation communications technology, applications, services, strategies and innovation. The Big 5G event is sponsored by Diamond Sponsor Cisco; Platinum Sponsors Huawei and NetComm Wireless; Gold Sponsors DigitalGlobe, Infoblox, Oracle, RAD and Sandvine; Silver Sponsors Calix, F5, LITEPOINT and Mobilite; Silver Track Sponsor Systemics; Breakfast Workshop Sponsor F5; Antenna Focus Day Silver Sponsor 3Z Telecom; and Exhibitors 3-GIS, 3Z Telecom, ETS Lindgren, Omnitron, Phazr, Remcom, and Vasona Networks. Sponsorship opportunities are still available; contact sales@lightreading.com. 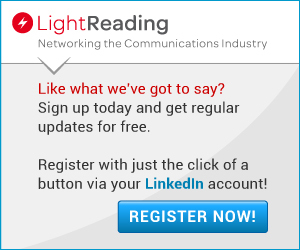 For speaking, workshop and partnership opportunities, contact events@lightreading.com. For more information about the event or to pre-register for updates, visit www.big5Gevent.com. Big 5G Event is a combination of Light Reading's annual flagship Big Communications Event and KNect365's annual 5G North America event. Cool event, right after this event, I plan to visit the best vegas shows and I want to buy tickets for several best shows now. I would be glad if you are interested in this advertisement. Wish you luck.